The Sega Saturn was struggling for quality games & one of the company’s biggest mascots hadn’t had any kind of proper impact on it. Sonic 3D had also been released on the Megadrive & didn’t showcase the Saturn’s power. 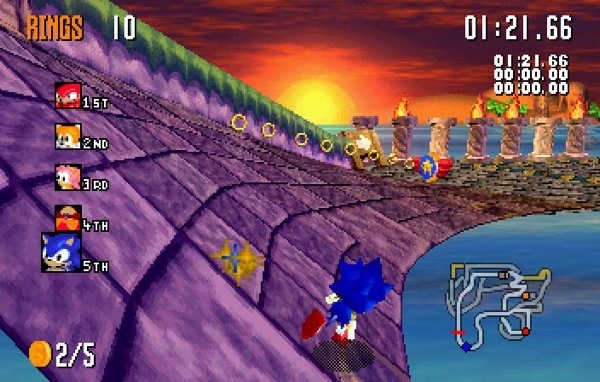 Sonic Jam, a compilation game, did include the very exciting Sonic World which allowed you to control Sonic small 3D world but that was about it. 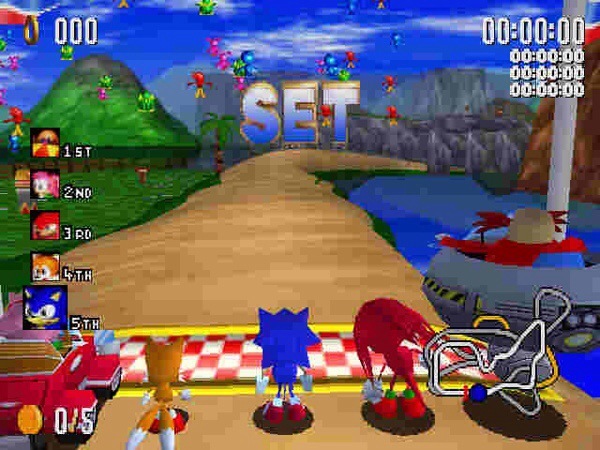 Sonic’s first fully 3D game turned out to be a racing game staring 10 (4 initially with 6 secret) regular Sonic characters facing off across numerous race tracks themed on the games. The story was the usual Sonic stuff… Dr Robotnik is after the chaos emeralds so Sonic & friends have to win races to earn emeralds & stop him. 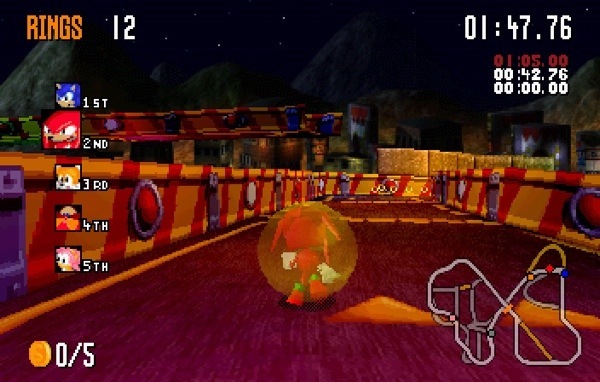 Sonic R can be compared to karting games such as Mario Kart albeit with frustrating controls & a lack of proper content. There are 5 race tracks with emphasis on exploration as each track has multiple paths & secret areas. It can be fun trying to find every path but the extremely frustrating controls can often limit how much you’re able to actually do (not without trying over & over again). Each character has their own unique abilities based off previous Sonic games. For example Sonic can run fast, Knuckles can glide & Tails can fly for a short period. All of these abilities help when it comes to uncovering shortcuts & dealing with the weather conditions. There are 3 weather conditions that can affect how the race pans out & what shortcuts are available (Clear, Rain & Snow). A snowy level can see lakes freezing over allowing you to run over them. It adds more to the game which considering there are only 5 tracks is quite necessary. Beyond that there isn’t much else…we have a ‘time attack’ mode & a 2 player multi-player mode. 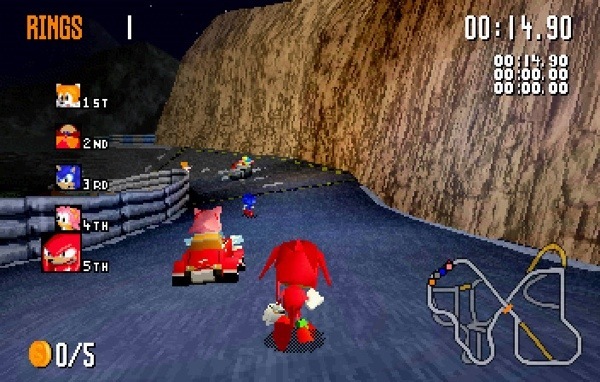 Sonic’s big 3D moment coming in a shape of racing game with such little content & poor controls will always be disappointing by today’s standard. During its initial release it was such a buzz to see Sonic in 3D that a lot was forgivable.